Five years ago, Viktoriya Kuksa learned of Sacramento Food Bank & Family Services’ (SFBFS) Parent Education program through a family member. Intrigued as a young stay-at-home mother, she started attending the classes. Parent Education offers free classes to new mothers and fathers, navigating them through their parenting journey. Taught by SFBFS’ volunteers, classes emphasize topics about nurturing little ones such as newborn health, car seat safety and potty training. However, classes also include topics like budgeting, self-care and stress management. For every class attended, parents earn credits which they can exchange for baby supplies including diapers, baby clothing, food and toys. In 2017-18, Parent Education received 9,171 visits to parenting workshops and led 451 parenting classes. Viktoriya has three children: Juliana, age 4, Inessa, age 2 and Karina, 6 months old. Sometimes it can be a challenge to bring all of them with her while she is attending the classes. Thankfully, her sister accompanies her to help watch the girls as Viktoriya attends classes. 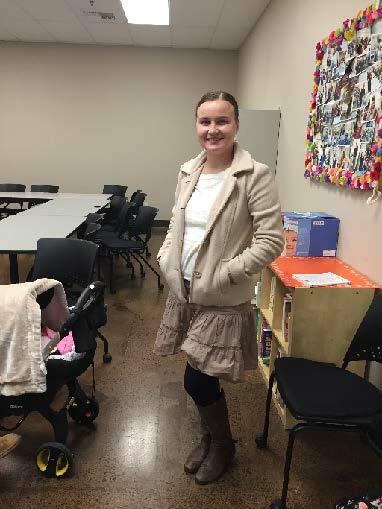 Throughout all of these years, Viktoriya still enjoys going to Parent Education classes because she constantly learns something new and applies those lessons while raising her girls. Viktoriya is known for her inquisitive nature and constant willingness to lend a helping hand. “She attends classes regularly and participates on a regular basis,” says Gabriela Lopez, SFBFS Parent Education Program Manager. “She is always patient and willing to help in whatever we need…willing to help set-up or clean up classes. [She is a] very confident mom. Always willing to help others, staff and parents included.” When Viktoriya is not attending classes, she enjoys cooking, singing and playing guitar. SFBFS aims to help move those toward self-sufficiency and financial independence through the Parent Education program. There may be no manual for parenting, but these classes help guide individuals to be the best they can be for themselves and their children. If you or someone you know is interested in getting involved with SFBFS’ Parent Education program, please call (916) 456-1980 or e-mail glopez@sacramentofoodbank.org.